Cornerstone OnDemand is a system that provides uncomplicated and social HR technology developed specifically for small and medium companies with head count of up to 400 employees. Cornerstone assists to monitor results and receive insight which can be used by growing organizations to train and develop their staff members. Cornerstone Growth Edition serves a diverse range of industries including media, technology, retail, manufacturing, healthcare, financial services, and hospitality. Prominent clients include DB Breweries, Affiliates Management Company, YouGov, Pinkberry, and Capita. Drill down to the details: Identify star performers, core competencies, and critical roles. View and build graphs to determine growth, trends, and improvements. View the entire organization: Use the 9 grid Helicopter view to see an overview of your organization and develop a deeper understanding of how your business is performing. Reach your goals more quickly: Enable employees to set personal and professional goals that can help them reach the next level and contribute useful work to the organization. Clear picture of performance: 360 degree reviews allow for more detailed reviews of employees, providing a better foundation for decision making on compensation and succession. Train and retain your employees: Training and development are proven ways to retain employees. Courses can be self-paced and HR can track employee progress. Motivate with recognition: Give badges to those who successfully complete trainings. Employees and their managers can track success together. Content made by you or the vendor: Create tailored courses or select from a library, all SCORM conformed. Offer courses in areas including project management, sales training, and customer service. Link training to performance: Assign training based on individual needs and performance. Help employees reach individual goals by developing their skills based on role. It is crucial to realize that virtually no service in the Corporate LMS Software category is an ideal solution that can meet all the needs of various company types, sizes and industries. It may be a good idea to read a few Cornerstone OnDemand reviews first as specific software can dominate exclusively in a really narrow group of applications or be prepared with a very specific industry in mind. Others may operate with a goal of being easy and intuitive and as a result lack complex functions desired by more experienced users. You can also come across services that support a large group of users and give you a powerful feature set, however this frequently comes at a more significant price of such a software. Make sure you're aware of your needs so that you buy a service that has exactly the functionalities you look for. How Much Does Cornerstone OnDemand Cost? Implementation varies and is based on the number of users. To tweak the solution according to company specifications, configuration starts at a one-time charge of $1,000 for Learning only and $2,000 for Performance only, depending on the size of the organization. We realize that when you make a decision to buy HR Software it’s important not only to see how experts evaluate it in their reviews, but also to find out if the real people and companies that buy it are actually satisfied with the product. That’s why we’ve created our behavior-based Customer Satisfaction Algorithm™ that gathers customer reviews, comments and Cornerstone OnDemand reviews across a wide range of social media sites. The data is then presented in an easy to digest form showing how many people had positive and negative experience with Cornerstone OnDemand. With that information at hand you should be equipped to make an informed buying decision that you won’t regret. What are Cornerstone OnDemand pricing details? What integrations are available for Cornerstone OnDemand? Apart from its ready-made integration with BambooHR, Cornerstone Growth Edition offers an API client that works with most business solutions. 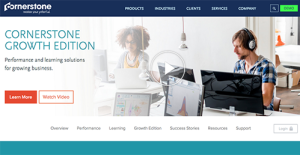 Pros: Cornerstone OnDemand serves for managing different aspects of human performance, including on-boarding, compensation, training, succession, interaction, and performance reviews. Even if this robust, the system can be managed by one admin console only, and it provides for granular control over access to information. I am positively surprised by the cross-feature functionality of the software, mostly because of the cohesive interconnection between different areas of the product. Cons: The system is not perfect-perfect, and I personally think there are two areas that need serious improvement: The first one is video support, which is less advanced than the ones of competitors. It would be better to incorporate video materials with Cornerstone, than purchasing a separate product for the purpose, The second one is design and apperance, even if this is not so important, and I'm already seeing some changes happening. Pros: There are many features, many functionalities, and most of all tools that help you discover those functionalities. Support is the cornerstone of Cornerstone, meaning that they are always there to help and to provide guides and courses. The courses are very specific, and you can choose the one you think it's relevant for your work. You are also entitled to participate in their webinars, use online customer support, and you're being appointed a special success manager. Cons: They are good to solve a problem when you mess up, but not when the system messes up. You discover a bug and notify them, but the most common answer is that they couldn't recreate the problem, or they simply return your support ticket without an explanation. It makes me feel both irrelevant and confused, especially when I have to wait for their answer for hours. In terms of functionality, you receive it one piece at a time: Instead of updating the entire system at once, you have to go step by step, risking to miss an important part that cannot be recovered. If you need more information about Cornerstone OnDemand or you simply have a question let us know what you need and we’ll forward your request directly to the vendor.